welcome to our eshop. 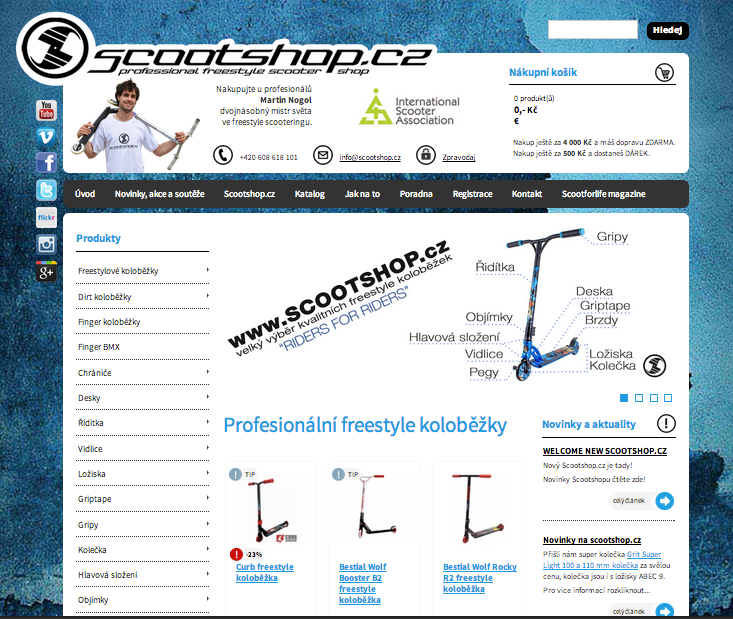 We like freestyle sports, so we decided to set up this e-shop and shop in Hradec Králové. The founder of the eshop Scootshop.cz is legendary rider Martin Nogol, one of the founders of Scootering not only in the Czech Republic but also in Europe. He has been driving since 2001. He has earned little success at prestigious races and ranks among the best riders of his time. Worlf First (Flair on the vertical ramp, 6x Tailwhip in U ramp, 900 in U-ramp.). It's one of the world's most respected scooter icons. The story of the Scootshop began one day when Martin Nogol decided to start his own business in 2011. In that year, he suffered a lot of injuries and felt he was no longer able to travel so actively. But he did not want to work elsewhere but his love, and they are freestyle scooters. He created a brand project and began working on the first eshop. Right after the launch of the eshop, the first orders arrived. :) We started organizing the first races and trying to promote as much as possible this sport in the Czech Republic. In 2013, Martin Nogol had a huge comeback in freestyle scooters and began to compete actively. In 2014 he won several races in Europe. In 2015 he participated in the first Big Air race in the USA. Where he finished in 9th place. In 2014, Scootshop.com became a distributor of Chilli scooters and Area longboards and Nokaic scooters. We also worked on a new site that came out in the first half of 2014. We experienced a big boom in 2016, when our distribution went up and sales increased sharply, thanks to our customer base and scooters. :) Also this year we started sponsoring the big faces of Czech scooter and opened a shop in Hradec Králové. Martin Nogol, unfortunately, had to decide if he wanted to continue sports or focus on business.